E74-like factor-3 (Elf3) is a transcription factor. This means that it is a protein involved in the expression of genes. Elf3 works with other proteins to regulate genes involved in inflammation and cancer; it is has been found to be abnormally expressed in some lung and breast cancers. 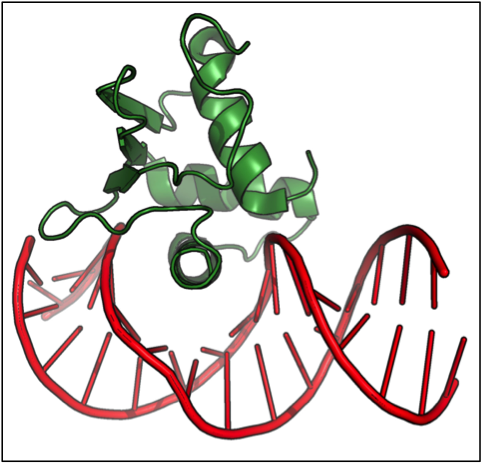 In order to ensure proper gene expression, transcription factor activity is highly regulated. Accordingly Elf3 is held in an “off” state and must be specifically turned on before it can bind to DNA to start gene expression. The interaction of Elf3 with DNA is also highly specific, again to avoid abnormal gene expression that may lead to disease. 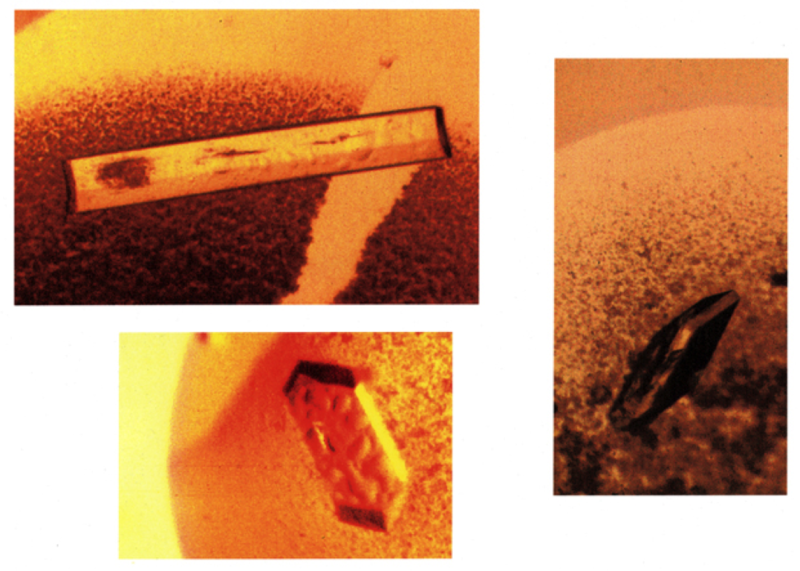 In order to learn how Elf3 recognises, binds and activates gene expression, researchers solved the crystal structure of the Elf3 bound to DNA from one of its target genes. This structure is of a specific part of mouse Elf3, the so-called E-twenty-six (Ets) domain, bound to DNA from mouse Type II TGF-b receptor promoter. Promoter DNA sequences provide a “start to read me from here” instruction to transcription factors so this structure provides lots of information about how the two molecules talk to each other. This structure is PDB ID 3JTH1. Roisin McMahon gets us into the jollity of the season…. What do reindeers hang on their Christmas trees? How come you never head about the tenth reindeer, Olive? 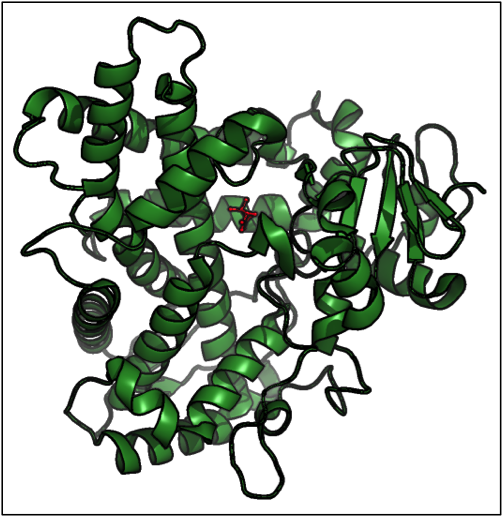 Today’s festive crystal structure is of reindeer β-lactoglobulin. 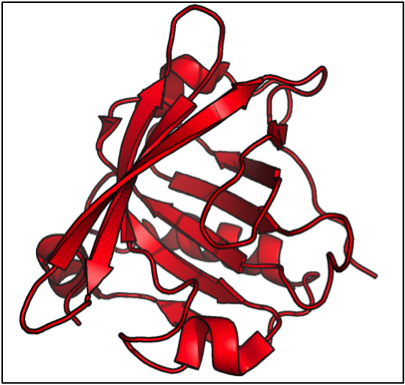 β-lactoglobulin is a whey protein present in the milk of many but not all mammals. It is not found in human milk. Despite extensive investigation, the function of β-lactroglobulin is not yet known. 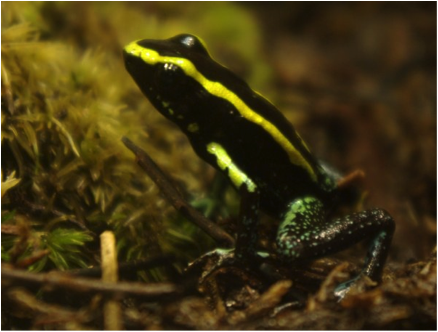 It may be a food source, or it may function as a carrier protein as it is known to bind hydrophobic molecules. β-lactoglobulins are part of the lipocalin superfamily. They have a 8 stranded β-barrel fold with one α-helix. 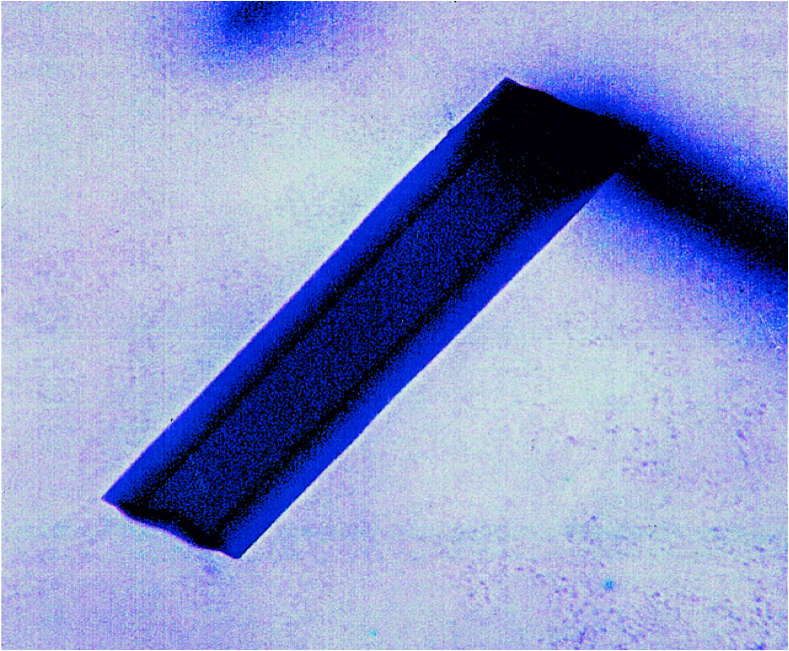 Hydrophobic molecules such as retinol or palmitic acid can bind within the centre of the barrel. 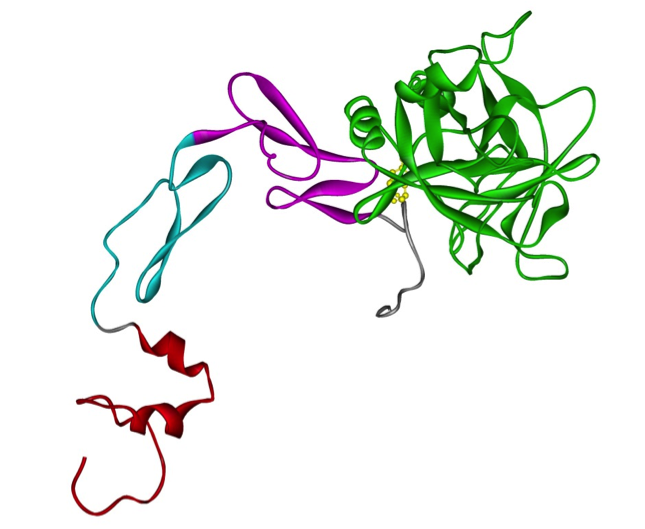 This structure is of reindeer β-lactoglobulin. The protein was purified from reindeer milk. (Q. How do you milk a reindeer? Answers on a post card please as I really wish I had a punch line for this one.) It is PDB ID 1YUP1. Munc18: No Munc-eying around with our molecular transport machinery! The transport of chemicals or proteins across the membranes of cells is a vital part of life. Chemicals may need to be released in order to send a signal to the cell next door, or sometimes, a protein must be relocate from inside the cell to sit on the cell membrane so it can do its job. For this reason, the Sec/Munc18 (SM) family of proteins—involved in fusion between two membranes—are an essential for this molecular transport and play a key part of healthy cell function. These SM proteins are involved in neurotransmitter release in the brain and in the maintenance of glucose levels (i.e. by relocating the glucose transporter to the cell surface so it can pump glucose into the cell). Within our cells, chemicals or molecules can be isolated from the rest of the cell contents by containing them within small membrane encapsulated vesicles. But the molecular mechanisms behind how proteins, including SM, coordinate the fusion of these vesicle membrane to the outer membrane of the cell, so that neurotransmitters or the glucose transporter can do their thing, is not understood. Crystal structures of SM proteins alone, and in complex with their partner proteins are helping us to decode the complex mechanisms of the membrane fusion event. And the importance of research in this area is essential for the development of new treatments for neurological diseases or diabetes. Indeed, Randy W. Schekman, Thomas C. Südhof, and James E. Rothman were awarded the 2013 Nobel Prize in Physiology or Medicine for their discoveries on the protein machinery that regulates vesicle traffic, including the SM proteins! You can read more about their Nobel Prize and their research here. SM proteins, such as Munc18-1 (or Munc18a) shown below, consist of three separate domains that fold into a U-shaped or arch-shaped architecture. 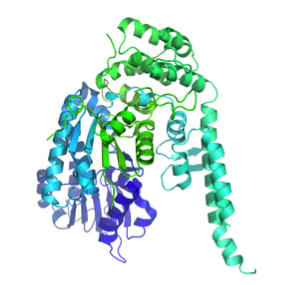 Image generated by Pymol (using the coordinates from the protein data bank (accession code: 3PUJ). 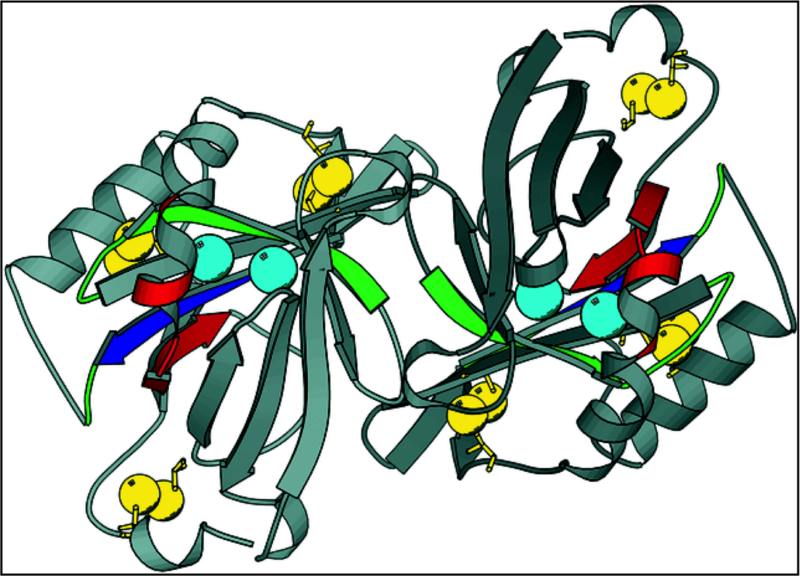 This is the structure of rat Munc18-1 that was solved in complex with a portion of its partner protein, syntaxin (Sx). The structure was published in 2011 PNAS by a team of researchers from the Institute for Molecular Bioscience, UQ, Australia. A total of 12 SM structures have been determined, either alone or complexed to a truncated protein partner or short peptide sequence. Click here for a review on the current structural information of SM proteins.